As with Hosts in Season 10, so does Home Again in Season 11 follows the mythological opening of the season and consists in a sequel of sorts of a classic “monster-of-the-week” case of the X-Files. 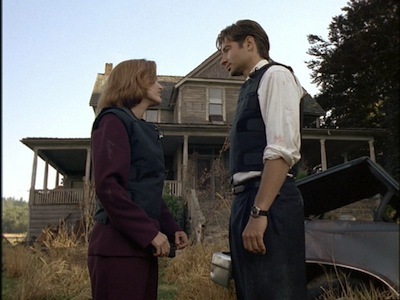 Home Again is of course the continuation of 4X03: Home, the infamous Morgan & Wong episode where Mulder and Scully come across a family of inbreds that lives separately from the rest of the world in an insalubrious farm stuck outside of time ever since the Civil War in the 19th century. 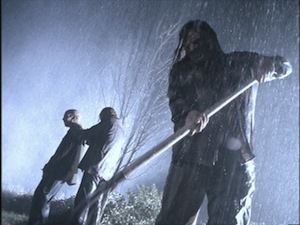 The episode had used this horror story template to muse about the concept of home as a shelter away from the other-ness of the rest of the world, and about the way the modern way of life, or change is general, comes and sweeps away the coziness and safety of home like an inescapable tide. The comics issues here echo these themes as well, in particular in Mrs Peacock’s soliloquies about the uniqueness and braveness of the Peacocks. In an unfortunate turn of events, “Home Again” is also the name of the 2016 X-Files revival’s second episode, written and directed by Glen Morgan. But where the IDW comics are, like one could expect from the title, a sequel to “Home“, the revival episode was only Morgan “being a punk” (in his words!) and only refers to Mulder and Scully’s return as FBI agents (and to Morgans re-return to The X-Files fold). We last saw the surviving members of the Peacocks, Edmund and his mother, driving off from their farm in Pennsylvania, at the sound of (Kenny James’ rendition of) Johnny Mathis’ “Wonderful, Wonderful” — being driven off their farm as a result of Mulder and Scully’s investigation, which resulted in the killing of two other brothers. Since that episode, the Peacocks settled in an even more remote place, in Nebraska; since 1996, enough time has passed for Mulder to meet a fully grown Peacock daughter, Molly. 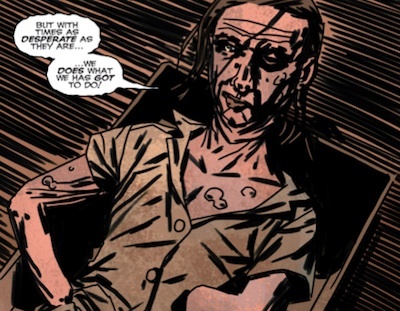 As would be expected with sequels — the same happened with Hosts — we get an origin story for the Peacocks via flashbacks, one before the episode and one after. We see through the eyes of Mrs Peacock how she has managed to keep the family going through sheer calculation of what is best and prolific, in the sense of fertile, for the family as a whole. As if being incestuous inbreds was not horrible enough, there is also parricide to add to the list. The spotlight on the Peacocks, iconic horror villains that have become a staple of the show, gives Harris the opportunity to set up some really creepy horror scenes. We had seen the horror of crippled Mrs Peacock under the bed, but the suggestion that Mulder will be forced to mate with her in order to inject new blood into the Peacock clan is really spooky. The way Edmund feeds his crippled mother or the looks of the deformed little Peacocks are also disgusting and frightening. The new Peacock farm is similar to the old one, complete with pigs eating the human remains — of whom we do not know, either trespassers or Peacock family members who died of their deformities. 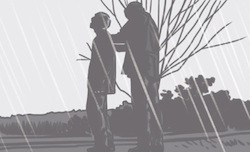 The farm is in the middle of a cornfield, also a staple of horror, like Children of the Corn or The Twilight Zone‘s “It’s a Good Life” — or, for that matter, the X-Files’ Home itself and the Fight the Future movie. The farm is also right next to several shale gas wells. As the kids tell Mulder in the opening of #2, the drilling wells “make the ground shake” and “the water catches fire when it runs“, earthquakes and water contamination being two accusations of environmental degradation and safety concerns that have been associated with the widespread development of shale gas plays in the USA since 2005 (explored in films like Promised Land and documentaries like Gasland). After the pipeline in S10#2 paralleling the real pipeline Keystone XL (officially cancelled by Obama very recently for reasons of concerns over its side effects on global warming), Harris uses more serious big business-related environmental concerns of our time. 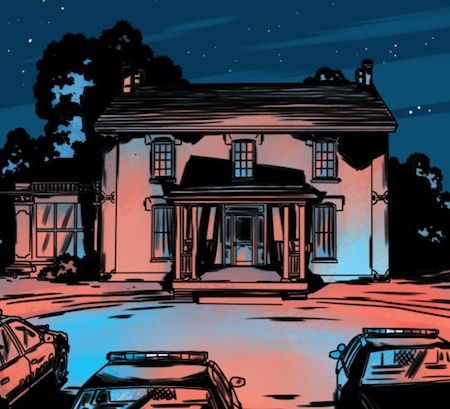 The issues are also well served by Smith’s art and Bellaire’s coloring — see in particular how the red-and-blue police lights flood the scenery in front of the Peacocks’ farm. Ultimately, drawn into a corner by the forces of modernity that appall them so much, the Peacocks choose to go out with a bang instead of surrendering, and burn themselves to death. The message, Gibson is trying to tell us, is that whatever modernity, or the new order of things, cannot control it destroys it and makes its dominion over the world complete. Interestingly, the story in the 1990s had ended with the traditional being displaced, moving further away to get away from modernity; the 2010s sequel has tradition completely destroyed. There is a parallel that is drawn here with Mulder, who is also running away or working in the basement like a recluse. With the Peacocks cornered and done for, Gibson might also want to make a point that it is pointless to resist him. Indeed, Mulder is led to the new Peacock farm by Gibson, and eventually the police and FBI are drawn to the Peacocks incidentally by chasing down Mulder. Mulder, and via him Gibson, is the reason why the Peacocks are destroyed. Skinner has been ousted from the FBI. 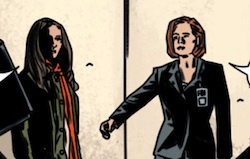 As hinted in S11#1, AD Morales is not completely duped by Gibson and seeks an ally in Scully. The “Secret Clearance or Higher” file she gives Scully proves to be just Cantus “Employee Handbook and Protocols”, something that drives Scully mad: she either missed something hidden, or Gibson timely replaced the file that was intended, either hacking Scully’s computer or by deceiving Morales as well. By the way, we learn Morales’ full name: Ana! Mulder and Scully spend a great part figuring out what Gibson’s plan is, all the while being unable to escape from becoming his pawns moved from location to location. 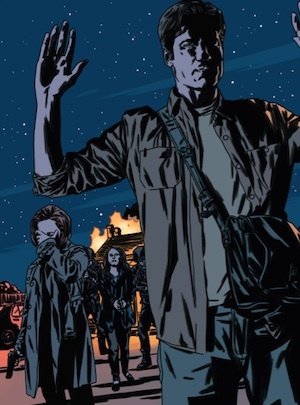 Throughout the three issues, several theories are made. Gibson, in direct telepathic link or via control of networked devices, or by telepathically controlling animals (wolves in S11#1, a crow here — crossover with The Crow? ), always checks what everyone is up to. Gibson reaches multiple objectives: he got to clear away the Peacock farm so that he can complete his array of wells/antennas; he got rid of the Peacocks, on whom he had no control (however they were hardly a threat to him); he wrapped up an X-File case Mulder and Scully were unable to satisfactorily resolve; he got the downed satellite chipset to communicate with whatever it is in contact with off the Earth (see S11#1); he got Mulder to be arrested by the FBI. How then to interpret the closing pages of #4? Scully thinks that after the developments with the Peacocks, Gibson might have been trying to help Mulder. While Mulder is obsessed with what Gibson’s plans are and tries to outguess him, Gibson is confident in his planning: “nothing you need to be concerned with, yet“. The ending puts Mulder in a position where the FBI easily arrests him, with the assistance of Scully, who might think that this is what her role here is supposed to be but complies anyway, as she wants to see Mulder back. His task done, Gibson has Mulder return to the FBI, where he might be accused of stealing FBI files but ultimately with the objective to wrap up a case he had not managed to wrap up the first time. Or perhaps the truth is different, perhaps Mulder is led back to the FBI as Gibon’s unwitting mole. Apart from a horrific sequel to a classic episode, Harris here manages to insert layer upon layer of mystery on what is really going on and on why strings are being pulled, which really is channeling the way the X-Files mythology was written. Once S11 is done, it would be interesting to know whether the accelerated schedule of the season because of the 2016 revival influenced at all how Home Again ended. Would Mulder still have been arrested, or would he have gone on various errands for Gibson while Scully tried to learn more from within the FBI, for several more issues? Indeed, #4 came out in November 2015, was solicited in August, and was written and planned some short time earlier in 2015 — all the while the revival series was being written and shot in June-September. Season 11 might end up being much more accelerated than initially planned, stroy-wise, essentially consisting in an introduction, Home Again, and a series of mythology revelations and wrap up of the Gibson storyline — instead of a better paced series over two years and more time devoted to the new status quo of Mulder and Scully separated. Let’s see where this takes us in the next issue, which promises to reveal to us a lot about who Gibson has become and what his plans are — before Season 11 wraps up with the story arc of #6-7-8. This entry was posted on Sunday, November 22nd, 2015 at 6:58 pm	and is filed under Comics. You can follow any responses to this entry through the RSS 2.0 feed. You can leave a response, or trackback from your own site.